There are some wonderfully innovative programs out there to promote books and reading. One of the nicest I’ve heard of is something called One Book One Community. It is put together by folks in the Waterloo region of Ontario. The format is simple: OBOC selects one single book to read, promote and discuss for that year’s program. Just one book. Imagine my delight that Lakeland has been selected for this year’s OBOC title! While I’ve known about this for a little while, I had to keep my mouth shut until the official launch, which took place today in a library branch in Waterloo, attended by guests and media. I’ll be in Ontario this fall for OBOC events in Cambridge, Kitchener, Waterloo and Elmira — and maybe some others. As for today, I got to send along a video message and reading which you can find on the Facebook page for OBOC. Naturally, any author is pleased to be singled out in a positive way. Lakeland will be promoted by the Waterloo Regional Library, by my friend Mandy Brouse and the folks at one of nation’s very finest independent bookstores, Words Worth Books — to name just two very nice perks for a certain lucky author. Far more importantly, OBOC offers a chance to discuss some complex and wonderful things: about how the earth under our feet shapes who we are; about what access to a clean lake now and then does for our state of mind; about how natural beauty is connected to our kids’ happiness; about how being lucky citizens of a lake-rich country like no other on earth shapes our quality of life. To me, literature isn’t about authors but about readers. It’s not about the words on the page, but about the ideas and discussion they may facilitate. A book ought to be just the beginning of dialogue, of many dialogues. I wrote Lakeland not merely in hopes that people would read my one book — gratifying though that may be on a personal level — but rather to do my part to drive a discussion that is just beginning to unfold in our society. One Book One Community, it seems to me, is really an opportunity for sustained discussion of community values. That’s something we don’t nearly get enough of in our fast-paced era, and I am honored and excited to be a part of what is to come. Check out what the Kitchener Waterloo Record had to say about the launch. The second-ever Canada Water Week, coinciding with World Water Day, is just about done. I spent yesterday traveling to Birch Hills, SK, to do a talk and reading from my book Lakeland for the local library annual fundraiser. It was an amazing evening that included, among other things, a sailboat used as decorative art. The night will get its own post shortly. Meantime, check out my latest piece, published on The Tyee. It’s all about how the Canadian federal government under Stephen Harper is exploiting a loophole in the Fisheries Act to turn virgin lakes into mining tailings ponds, thereby destroying them in perpetuity. Sadly, this is not all. In just the last few days, a leaked government document has come to light showing that the Harper conservatives intend to entirely remove the concept of habitat protection from the aforementioned Fisheries Act. The damning document was brought up in the House of Commons by British Columbia MP Fin Donelly. The government did not deny nor disavow the document, and it confirmed that unspecified changes to the act were forthcoming. My colleagues from Nature Canada’s Stop Wasting Our Lakes Campaign and Living Lakes Canada have received warning that the Harper government intends tack these legislative changes onto the federal budget bill due to be tabled in just a few days. As is always the case with these omnibus bills, the intention is bury the unpleasantness in mountain of paper. The media and opposition will be spread thin trying to deal with the fallout of the whole budget. Who’s going to notice a little wording change in the Fisheries Act? The Fisheries Act is one of our oldest environmental laws in Canada, and indeed the world. Its concept of habitat protection is simply to support fish but to protect the whole pyramid of life upon which fish depend. Habitat-level protection is holistic law, the kind of thing we need more of, not less. Losing it will be a terrible, and dangerous, setback. The budget comes down in a few days. I would dearly love to be wrong about this. If you have any influence with the government of the day, please use it nip this ill-considered move in the bud. Make a liar out of me, please. Since returning from the writing sojourn in America, I find myself fallen headlong into the world of visual art. The Blossom Project is all about giving away paintings, and I have partnered up with the artist Marlene Yuzak (to whom I am also married). We got the idea while riding a bus one morning to New York. The idea just took flight, and now seems to be taking us for a ride. Anyway, the one-night exhibition is really just the beginning of an experiment which asks the question: “If you give away some art, will it make the world a little better?” After hanging briefly on the gallery walls, Marlene’s 20 paintings will come down and get packaged in mailing tubes and be sent off as gifts to people around the world. For the most part the recipients will be people who don’t know us. They will open their package to find a large, original watercolour painting, mostly semi-abstract whorls of bright colour, or hearts strung together by ink lines — and they will be surprised and delighted. It is my job to make sure they are not also freaked out or confused. My task is to write accompanying letters to each recipient explaining why they have been singled out to receive this unexpected gift from an artist in far-off Canada. What kind of good work? For a guide, we are using the Millennium Development Goals, a set of global targets developed by United Nations and agreed to by all 192 member countries in that organization. If ever there was a blueprint for a better world, the Millennium Development Goals package is IT. The Blossom Project has its own website [The Blossom Project site has now been taken down. Thanks for visiting! ], and you can get the complete story there. Most importantly you can also suggest names for our Recipient List. We really need help finding likely candidates, especially in Africa, Asia and South America. Every kid has a favourite colour. I find it endearing when adults reveal that they still retain their loyalty to their old favourite hue. I take it as a sign that they can still access childlike wonder in the five senses, in what is elemental. Kathleen O’Grady’s favourite colour is blue. Blue as in water. Kathleen is a clothing designer who uses blue-dyed textiles in her line called Grady Bleu (yes, spelled the French way). 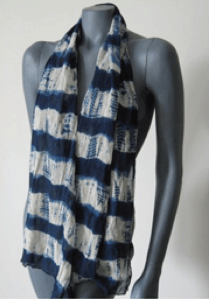 I met her at a World Water Day lecture a few weeks ago, and she explained that her interest in indigo and other traditional dyes was connected to her desire for a sustainable water future on this blue planet. Natural dyes have been used for generations all over the world. The techniques are kept alive in villages in many developing countries and Kathleen says supporting these cottage industries helps provide a sustainable livelihood to artisans, and it offers an alternative to the mass-produced, high-profit-low-pay globalized textile industry. Relative to synthetics, natural dyes also have a low impact on the environment — particularly water. Grady Bleu is a “labour of love” project that allows the artist to work with beautiful, low-impact textiles while simultaneously raising awareness about water sustainability, the issue, she says, that will define the 21rst century. To follow Kathleen’s story further, and to find out more about her clothing line, visit www.gradybleu.com. If you are in Saskatoon this coming Monday, March 21, please join me over the lunch hour in Convocation Hall on the University of Saskatchewan campus where I will be giving a talk called Synchronized Swimming: How Citizens, Scientists and other species can work together for water right now. The university has just embarked upon an ambitious, seven-year research project that will redefine water security in our own backyard and around the world. I’m going to talk about how non-specialist, average citizens like you and me are crucial if we are going to leverage all this great science into a sustainable water future. The talk will open U of S Water Week, a series of lunch time presentations to celebrate World Water Day. Garth Materie from the CBC’s Blue Sky will be hosting. The folks at the university really want to reach out to citizens right now, to engage people in what they are doing on the science front, and this isn’t just public relations. Because in about seven years, some of the brightest people on the planet are going to hand us a blueprint for a water future that can serve both human beings and ecosystems. Building it is another matter, however. Scientists cannot do that for us. We have to do this ourselves, as a society. As someone keenly interested in building direct partnerships between lay citizens and professional scientists, I am delighted and honored to be the only non-scientist on the Water Week roster, glad to walk through a door that is opened. I would love to see my friends and colleagues from town. For those too far away, the talk will be available online, and I will post a link. But it would be better to just be there. Lakeland: Ballad of a Freshwater Country (Greystone Books / Douglas & McIntyre) is now available wherever books are sold. Click the "Lakeland" link in the menu bar for more info. Hey folks, just a heads-up that I have a couple of chapters in this new guide to Canada's National Parks. It is put together by our friends at National Geographic down in Washington, DC.